Glitzy city of Dubai is one of the supreme hot spots for vacations and shopping. The mesmerizing land of sand dunes has come a long way to develop into a city of sky high buildings and malls and has completely transformed itself from a desert garrison to du-jour destination; where people come to enjoy sale bargains, family fun and earthly beauty. Dubai is specifically famous for its spellbinding sight-seeing attractions that comprise of an outspread array of destinations ranging from the world’s tallest building (Burj Khalifa) to the world’s largest shopping mall (The Dubai Mall). Considering the best sightseeing attractions of the city, Dubai has numerous ethnic high spots as well as modern and glamorous add-ons. Wandering about the District of Baskatia, you will get a chance to discover the old Dubai; however, cruising along the Dubai Creek will allow you to realize that the city has much more than its ostentatious veneer. Though one may never get enough enchanted by the enthralling fascinations of the city; here mentioned are the top 10 breathtaking views and places that are must-see when you been to Dubai. The landmark megalith of Dubai is the great Burj Khalifa which is by far the tallest building of the world. Proudly standing at 829.8 meters, it seems touching the sky. Burj Khalifa is the most highlighted and admired sight of the visitors and tourists in Dubai. 360 degree view from the ‘Observation Deck’ situated over the 124th floor of this monolith is a must-do. Panoramic city lights view and bird’s eye metropolis outlook of the skyline from the observation deck are unquestionably breathtaking. The great sarsen of Burj Khalifa has entry from the Dubai Mall. Burj Khalifa is one of the marvelous & the best things to see in Dubai upon your visit. Burj Al-Arab is the tallest hotel of the world which stands 321 meters high in the sky. This great plinth stands on its very own man-made island built on the coastline. This mega structure is also the most expensive hotel of Dubai. It gives a breathtaking view at night when it displays the specially choreographed night light show. To enjoy the panoramic urban view, Skyview bar situated on the 27th floor is idyllic. Wild Wadi Water Park is one of the finest water parks situated next to Jumeirah Beach Hotel and Burj Al-Arab. Encumbered with adrenaline rushing rides, this place is a fun. One can enjoy the monstrous rides and enormous fun creatures. The place is one of the finest blends of technology and entertainment that could be enjoyed when having vacations in Dubai. The Wild Wadi Water Park is also a preferred place to bring your kids for a fun day in Dubai. Situated off the coastline of Dubai, Palm Jumeirah is an incredible excellence of man-made architectures. This sight is highly scenic and worth spending time to see the engineering brilliance competing the natural boundaries of the sea. A car drive all along from Atlantis is highly recommended to beautifully capture the lifetime memories of this great landscape. This unique attraction is certainly among the best things to see in Dubai. The Dubai Water Fountain is one of the most sought after sightseeing attraction after Burj Khalifa and Burj Al-Arab. It is the largest man-made and choreographed fountain that is set in front of Burj Khalifa. 275 m long and 152.4 m high, this fountain offers a spectacular sight when accompanied by colorful lighting and contemporary & classical Arabic music. The dancing water show is an absolute amusement will definitely be a treat to your eyes. Jumeirah Mosque is one of the most beautiful mosques of Dubai. This mosque is built exactly as a replica of Al-Azhar Mosque – Cairo. This mosque is a fine piece of Islamic architecture that is beautifully structured in old-fashioned Fatimid convention and displays the exclusive details of the customary stone work. This marvelous groundwork offers an extravagant view of construction and design. The great architecture of Jumeirah Mosque invites tourists and among the top things to see in Dubai. Mall of the Emirates is particularly famous for its ice skiing facility. The mall has successfully develop slopes for ice skiing at Ski Dubai. It has a great mesmeric penguin arena and chairlifts that amuse you to ski at -40 Celsius. Escorted with a family entertainment arena and cinema complex, this place is a conceivable panorama. Being the largest mall in the world, The Dubai Mall is particularly famous for Dubai Shopping Festival. This gigantic shopping complex has over 1500 shops and uncountable entertaining activities including Dubai Ice Rink, Aquarium and Underwater Zoo, etc. This marvelous infrastructure offers an enormous display of luxury and extravagance and portrays a tremendous sight to capture. To enjoy the ultimate beauty of white glittering shingle, nothing can beat the exquisiteness of the Jumeirah Beach. Stretched across the southern coast to the intersection of The Palm Jumeirah, this beautiful beach features numerous large and exclusive sites such as hotels, housing, resorts and lounges, including Burj Al-Arab, Jumeirah Beach Hotel, Wild Wadi Water Park and Madinat Jumeirah. You can also catch an exclusive views of Dubai sunset from Jumeirah Beach. Last but obviously not the least, another big sightseeing attraction in Dubai is Dubai Aquarium, which is officially the dynasty of 140 sea species. Situated on the ground floor of the great Dubai Mall, Dubai Aquarium is a gargantuan tank. Underwater Zoo can also been here by passing through the tunnels of this huge aquarium. This is an absolute breathtaking view when you get a chance to zoom through the myriads of the aquatic life. 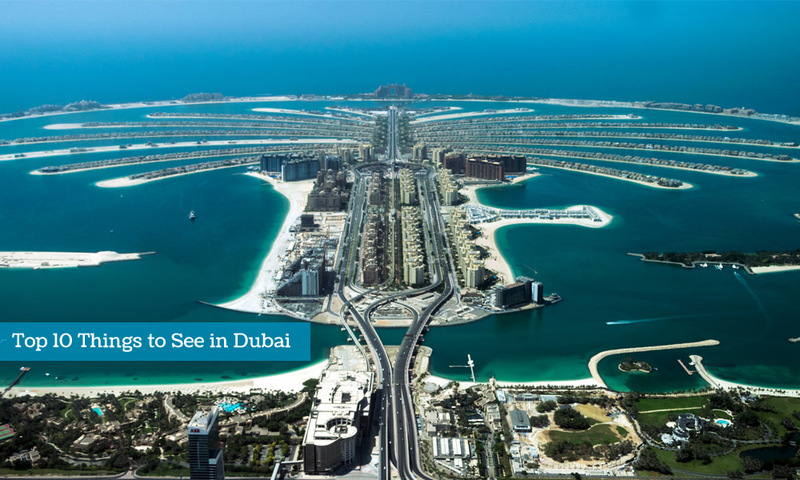 These are top 10 things to see in Dubai which you should not miss upon your visit. There are plenty more must-see places in Dubai and feel free to recommend one by adding comments below.